On April 29th, despite blizzard conditions, Coloradans bundled up and took to the streets in the name of climate action. Thank you to everyone who participated and especially to all of the organizers, allies and volunteers who helped make the events a huge success! We closed out the first 100 days of the current Administration with a huge demonstration highlighting our recognition that climate change is real, it impacts all of us, and that we are committed to solving it. The PCM in Denver, along with other sister city marches, happened simultaneously with the People’s Climate March in Washington. Like the Women’s March, the PCM was a national show of resistance, power and unity. In Denver, over 8,000 people gathered in snowy conditions and demanded climate action now. Speakers and performers representing many faiths, cultures and backgrounds presented a brighter vision for the world: one that prioritizes historically disenfranchised communities, and unleashes an unstoppable clean energy revolution that produces good jobs and tackles the climate crisis, bringing forth an economy that works for all of us. Led by indigenous leaders and youth activists, the march highlighted the voices of communities most directly affected by climate change. The march was a collaborative effort of environmental, social, racial, and economic justice groups. We know that our fights are tied together, and only together we will succeed. United, we celebrate our differences and demand a safe and livable climate, an economy that provides sustainable jobs, and justice truly for all. We mobilized in resistance to the systems that attempt to divide us, and rise to build bold solutions for the brighter future we know is possible. Together, we resist, we build, we rise. Check Out More Photos and Tag Yourself Here! After having to postpone the march due to snow, 400 people rallied against climate change in Colorado Springs on Sunday. In Durango, 650 marchers took to the streets! They have been faxing images from the march to congress everyday with a request for climate action. Greeley had over100 people march during their annual spring block party! Pueblo, Cortez, Carbondale, Aspen and many more hosted climate marches, showing that climate action is a priority statewide. Hundreds of thousands marched in over 375 cities across the nation. Over 200,000 people marched in Washington DC, surrounding the white house and standing up against the degradation of our planet and for the protection of people. Watch it come to life here! What now? We came together to make our voices clear, now we have to take action to make sure our elected officials know this is the beginning, not the end. Get involved. Find a local team near you and attend an event to get engaged in the climate movement and meet others. Check our calendar for upcoming events. Let’s make this march viral! Share your videos, pictures and stories from a People’s Climate March to everyone you know and to your elected officials. Let them know we are watching. Become a leader: Join us in Denver, June 3-4 for a Climate Leadership Workshop. More details to come soon! Want to show your support? Donate to help cover the costs of the march — If you can donate even a few dollars, please click here. 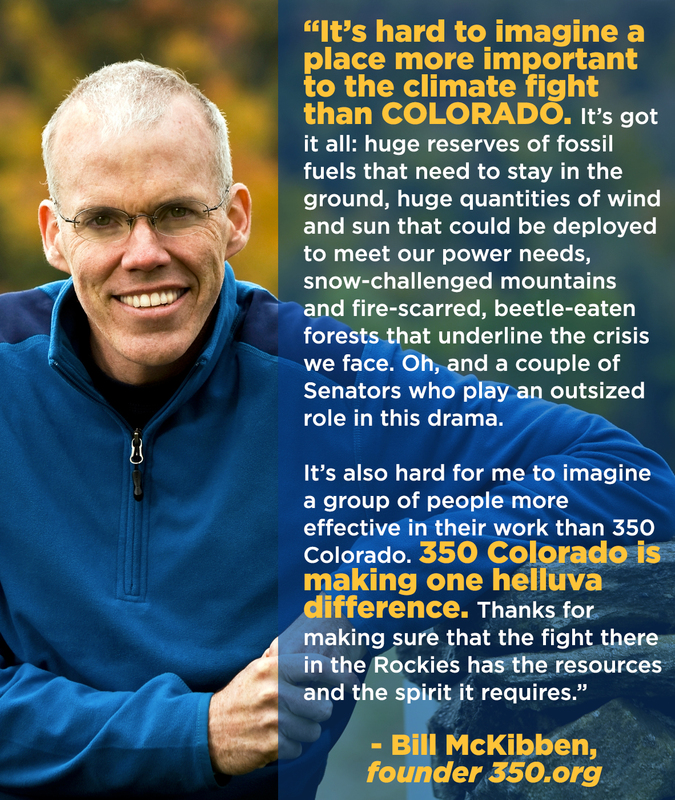 Thanks for your help to build the climate movement in Colorado! Our partners: People’s Climate of Colorado, Conservation Colorado/Protegete, Colorado People’s Alliance, Sierra Club, Climate Reality Project, GreenFaith, CO Interfaith Power & Light, Eco-Justice Ministry, Food & Water Watch, Rocky Mountain Peace and Justice Center and more! Core 350CO staff and volunteers: Ellen Kerchner, Julia Williams, Evan Frierich, Dan Greenberg, Lianna Iacob, Barbara Donachy, Kevin Nelson, Mark Steele, and so many more who volunteered, showed up for art builds, and donated time and money! Sponsors/contributors: Ecocycle, videographers Alex Sandberg, Alex Nicks and Anders Carlson, John Fielder Photography, Magicbrusharts.com, Turin Bicycles, Wind Walker arts, Evan Freirich, 350.org, PCM National, EnergiSimple, Alfalfa’s Market and everyone else who chipped in generous donations to support 350 Colorado’s participation in the People’s Climate March. Donald Trump’s election is a threat to the future of our planet, the safety of our communities, and the health of our families. As communities around the world confront intensifying impacts of climate change, this administration is rolling back hard-won protections of our climate; issuing assaults on air, water and land; and unleashing direct attacks on indigenous peoples, people of color, immigrants, workers, LGBTQ+, women, young people, low-income communities and more. Trump and his corrupt cabinet offer a dark vision of the world: one where the fundamental rights to clean air and water are denied, where scientific fact is ignored, where the powerful few prosper at the expense of the people and the planet. But we have a brighter vision for the world: one that prioritizes historically disenfranchised communities, and unleashes an unstoppable clean energy revolution that produces good jobs and tackles the climate crisis, bringing forth an economy that works for all of us. Our fights are tied together, and only togther we will succeed. United, we celebrate our differences and demand a safe and livable climate, an economy that provides sustainable jobs, and justice truly for all. At the 2014 People’s Climate March, we said it takes everyone to change everything. Now, with everything at stake, everyone has a part to play. While the current administration offers a dark and divisive vision for the world, we envision a world where the dignity of all peoples is respected, and the clean energy revolution creates and retains fair union jobs and tackles climate change. That’s why on April 29, we will mobilize in resistance to the systems that attempt to divide us, and rise to build bold solutions for the brighter future we know is possible. Together, we resist, we build, we rise. To view a map of the event, march route, and answers to frequently asked questions – click here!